. . . what is inhibiting scalability ? Note: all elapsed times in this blog post are captured from a warm buffer cache with management studio set to discard results from the results grid after execution. With hyper-threading enabled; “At 4 cores” corresponds to a degree of parallelism (DOP) of 8, assuming two hyper-threads per physical core are used. Can we get more fine grained wait stats ? 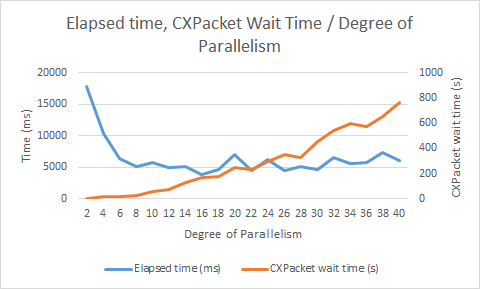 As the elapsed time plateaus off, CPU time and CX Packet wait time continues to rise. This pattern is similar to that observed with spin lock spins as the number of threads processing an OLTP workload increases. What exactly is a CX packet wait ? The memory required by parallel exchange iterators is used for the allocation of the CXPacketList first in first out queue, packets are placed onto this structure and removed from it under the protection of the X_PACKET_LIST spinlock. 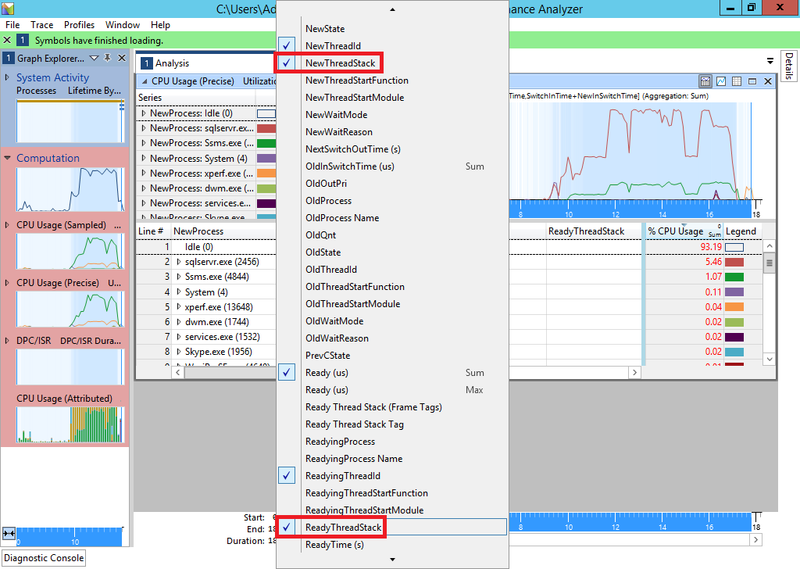 What can windows performance toolkit tell is ? Line 22 contains the call sqllang.dll!CTds74::SendRowImpl, I suspect the Tds is short for tabular data stream, implying that this thread is heavily involved in rendering the result set. Note line 36, also highlighted, the thread has burned 782,358 ms of CPU time and the context switch has burned 306,617 ms, 40% of the threads CPU time has been burned up by a context switch. It is both well known and a well documented fact that context switches are expensive, however, using windows performance toolkit has allowed us to quantify this. What About The Worker Threads ? No threads relating to the execution of the query with a degree of parallelism of 2 show up, which is why the graph starts at a degree of parallelism of 4. For brevity the graph does not go all the way up to a degree of parallelism of 40. CPU time is the average CPU time per worker thread and wait time is the average wait time per worker thread. As it has already been established that the highest CPU utilisation achieved is 16% (across the whole box) ready time can be disregarded as the cause of the poor scalability being observed. What Does The Graph Tells Us ? 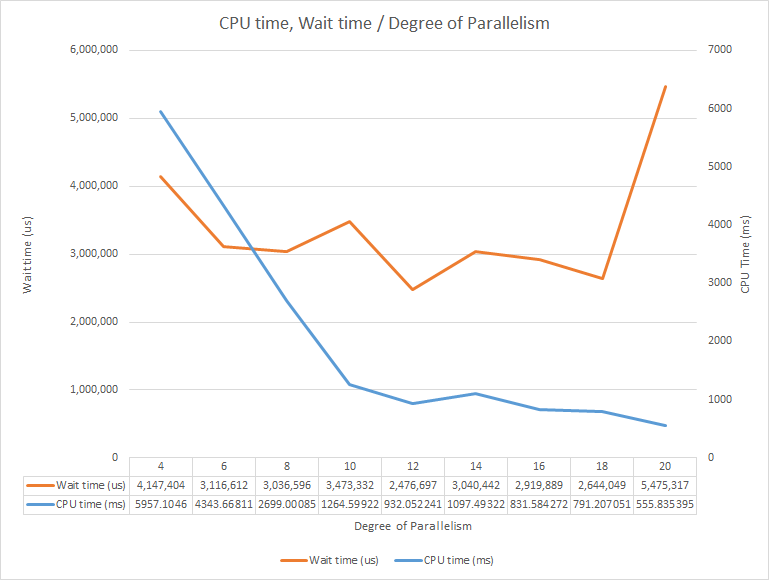 My hope was as average CPU utilisation per thread decreased, wait time would increase, but the wait time data shows no obvious pattern, the conclusion from this is that the waits are being experienced on something that windows performance toolkit is not capturing. Lets try a different approach . . .
Appending a number after the GO at the end of the statement allows it to be executed in a loop from within management studio. Dump files (mini dumps will suffice) can be created whilst the query is running, this is another way of capturing thread stack traces, Thomas Kejser has produced a good article on the subject which can be found here. 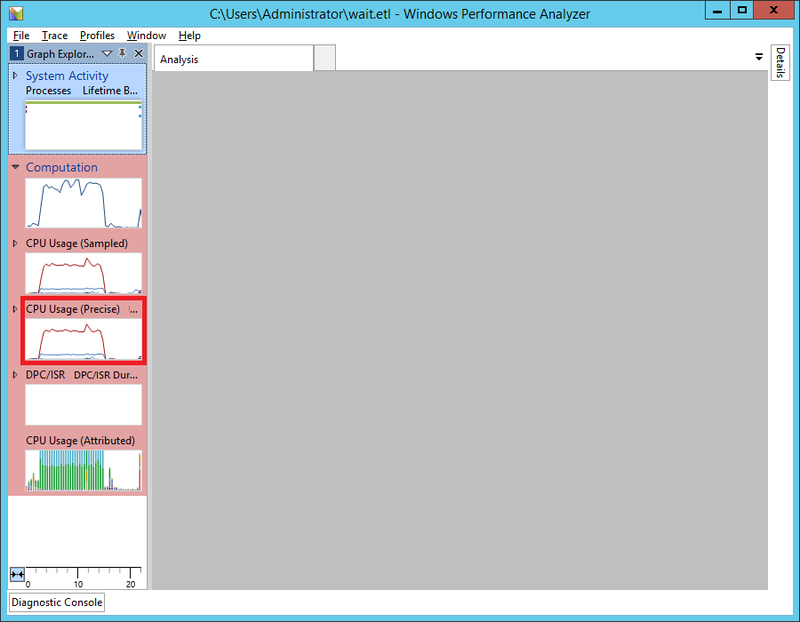 windbg presents call stacks in a subtly different way to windows performance analyzer, i.e. bottom up and not top down. 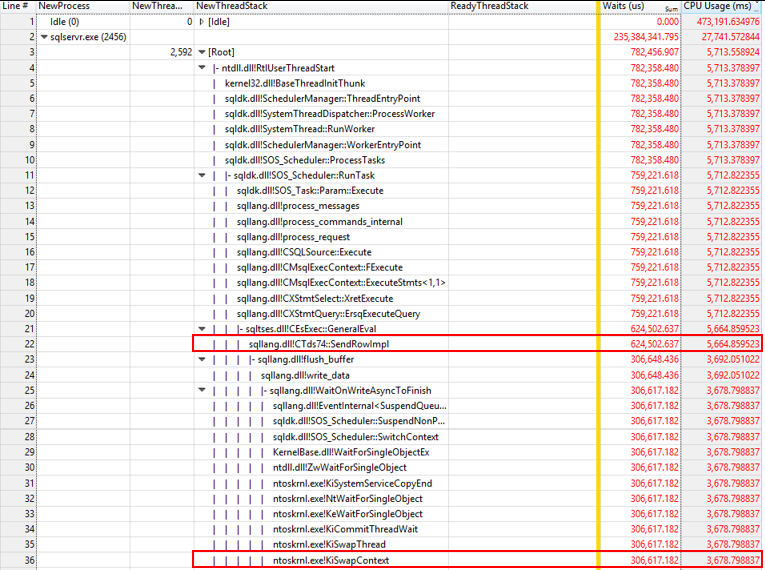 The call stacks caught in both the event trace for windows file (via xperf) and the mini dump both suggest that a call to sqlmin!CXPipe::Pull is waiting for a packet to be made available from a parallel exchange iterator. Also the time attributed to waits experienced by sqlmin!CXPipe::Pull is not being captured in its entirety by windows performance toolkit. In my haste when writing this blog originally I did not explicitly answer the question posed at the top of the post. 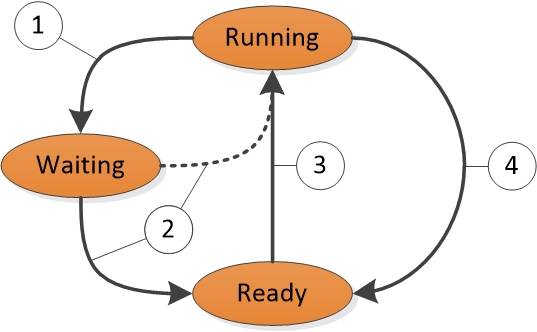 The scalability of the query is inhibited by the distribute streams iterator, or more precisely by the fact that there are multiple threads contending on a single thread for packets. 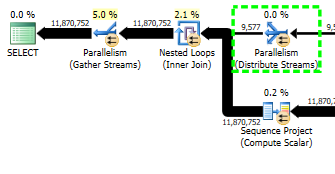 Removing the top clause from the query removes the distribute streams iterator from the plan, however scalability still goes flat after a degree of parallelism of 8, my suspicion being that the bottleneck becomes the gather streams iterator, . . . which begs the question posed in final thought #2 below. There is obviously a relationship between execution plan shape and scalability, this post has barely scratched the surface of the subject. Every execution plan irrespective of the number of worker threads it uses has a serial region. The parallel insert feature has existed since SQL Server 2014 and is furnished through the SELECT INTO statement, SQL Server 2016 lifts this restriction and allows INSERT SELECT statements to be performed across more than one worker thread. If the bottleneck in our query is the gather streams iterator, what happens if the result set is being rendered into a partitioned table with each worker thread’s data going into its own partition, does this result in better scalability ?. There is another phenomenon which is not so well documented and publicized and that is the addition of a new level to the CPU cache hierarchy every ten years, this is because trips out to main memory are so expensive. The fact that the CPU cache exists in the first place is only part of the story, the types of data structures used and the way in which they are accessed has big performance and scalability ramifications. Hash joins, any form of sort and index seeks all cause random memory access, this makes it difficult for the pre-fetcher to its job as it cannot preempt what to bring into the CPU cache from main memory next if the memory access pattern is random.